You're going to fry the chips in a small amount of oil — about 1/4 inch. The key is making sure your oil is between 350° and 375°F. The optimal is 360°, but you're fine anywhere in that range. However, because you're using such a small amount of oil, it's difficult to get an accurate temperature reading. It's not like you can stick a candy or deep-frying thermometer in, since the oil isn't deep enough. So, here's the trick. Heat the oil up for a few minutes on medium heat, and then test it by placing the tip of a wooden spoon into the pan. When the oil is at the the proper temperature, the oil will bubble around the tip of the spoon. A wooden chopstick will work too. Speaking of oil, be sure to use a refined vegetable oil such as sunflower, soybean, or safflower with a high smoke point. How much oil you need will depend on how wide your pan is. A cast iron skillet is great because it'll maintain its temperature even after you add the chips to the oil. Another trick is using tortillas that are slightly stale. 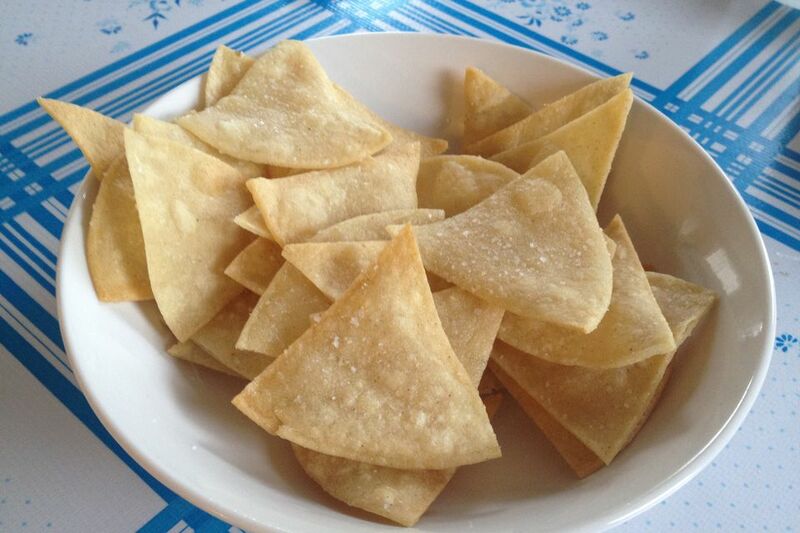 The reason being, staling happens when bread (or in this case tortillas) lose their moisture, and dry tortillas will fry up crispier than fresh ones. All you need to do is take the tortillas out of the bag and leave them out overnight on something flat. Like the kitchen counter. A package of a dozen tortillas will make a very generous basket of tortilla chips, enough for 3 to 4 people, and just the right amount to go with this fabulous 3-avocado guacamole recipe. Coincidence? I think not. Finally, you can use this same technique to make your own tostadas. Simply fry the whole tortillas without cutting them first. Leave the tortillas out in your kitchen, uncovered, overnight. Cut them into wedges using a knife or pizza cutter. Three cuts will make six chips from each tortilla. But you can stack them and do two or three at a time. Heat the oil to 360°F. The oil will bubble around the tip of a wooden spoon. Add enough chips to cover the bottom of the pan in a single layer, without crowding or overlapping. Fry for 2 to 3 minutes or until the chips have turned lightly golden brown and are quite crisp and firm. Flip them occasionally with a pair of tongs so that they cook evenly. Remove each chip from the oil with your tongs, letting excess oil drain back into the pan, and transfer to paper towels, sprinkle with salt, and then repeat the process until all the chips are cooked. Serve warm with fresh homemade salsa.